Aug. 1, PM Update: Today's minimally rain-cooled (a trace) high temperature of 82° is the coolest since July kicked off with 81°. That has already been factored into the August projection below. Note on regression (see below): If the regression relationship shown in the July vs. August correlation plot were to hold exactly, the August average would be 78.9°, bringing the summer average to 80.9°. 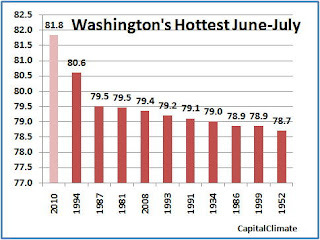 Aug. 1, AM Update: Although there is no official record report as of yet from the National Weather Service, this morning's preliminary monthly climate report confirms that the Washington July average was indeed 83.1°, tying the record for hottest July (and hottest month of all time, since the hottest August was 82.8°). Here's how much of a squeaker this record was, however. The monthly average is computed by averaging all of the daily high and low temperatures in a month. Since temperatures are reported in whole degrees Fahrenheit, the average is calculated to the nearest tenth of a degree. 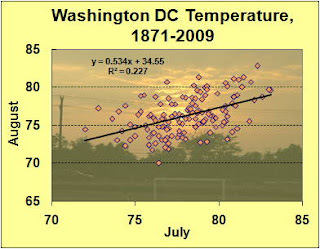 To 3 decimal places, however, the July 2010 average was 83.065°, which rounds up to 83.1° (thanks to Mr. Softee's Excel™). If any one of the daily highs or lows had been 1° cooler, the average would have been 83.048°, which rounds down to 83.0°, missing the record and tying for second place. Now, consider yesterday's morning low of 71°. At midnight local time, the temperature had dropped only to 78°. Since daily records are kept on standard time, the month was not closed out until 1 am EDT, when the temperature was at 76°, still not a problem for the record. Showers were moving into the area, however, and by 2:16 am an updated report showed the temperature had already dropped to 70°. This means that the record held by as little as 1 hour and 16 minutes. Since June set a monthly record, the June-July average of 81.8° is also a record by a wide margin over the 80.6° in 1994. 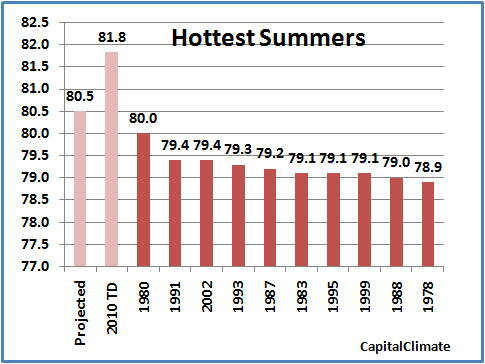 As the summer seasonal average to date, it's also a huge excess over 1980's record pace. On the other hand, average temperatures decline in August, so it's unlikely that pace can be continued. 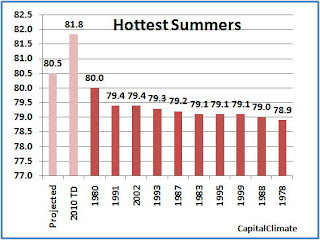 Notice that despite 1994's record performance for the first 2 months, a cool August by about 2° below average knocked it completely out of the top 10 hottest summers. 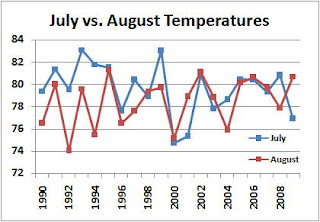 In 1980, however, a relatively cool June was followed by a very hot July and August. What con be expected for the remainder of this summer? Even projecting an average August, the final summer average would still break the heat record. The upcoming week, however, is already likely to have temperatures in the 90s. 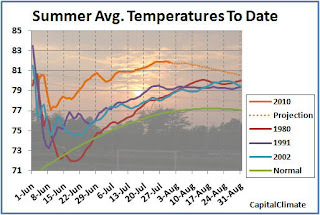 Factoring in the forecast for the next 7 days and the climatological average for the rest of the month, this year's summer average would be 80.5°, a very impressive 0.5° above the current record from 1980. Is there any clue to August's behavior from the fact that it's been so hot in July? 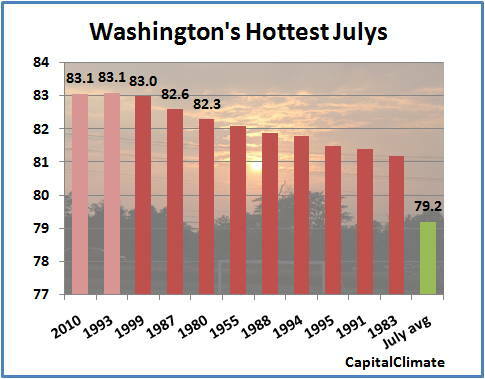 Although there is little month-to-month correlation in Washington temperatures, the July-August correlation is one of the strongest in the year. The correlation coefficient of 0.227 says that about 23% of the variance in August temperature is explained by July's temperature. (The June-July correlation is only 0.133.) 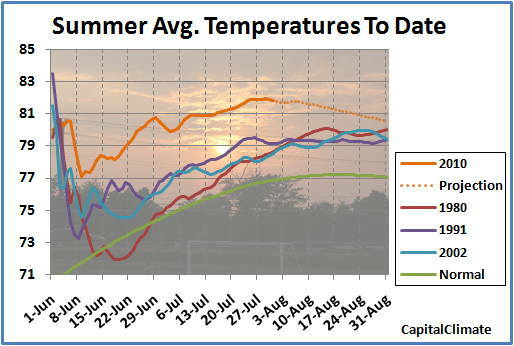 If you look at the right hand side of the chart of July vs. August temperatures, you can see that all of the hottest Julys are at or above the trend. Furthermore, 10 of the top 11 hottest Julys have had August averages above the current August normal of 77.4°. Looking at all 28 of the past Julys with averages above 80°, the average for August was 78.1°, which is above average. 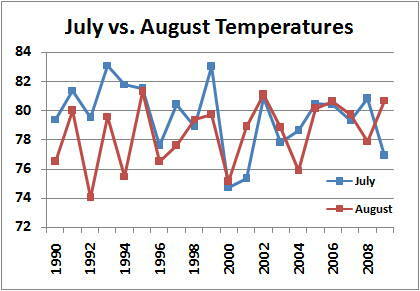 In recent years, with the notable exceptions of 2004 and 2008, there has also been a tendency for August temperatures to be near or hotter than July on average, even though the long-term average is reversed. So, it's hardly a guarantee, but the odds are definitely in favor of a record. Stay tuned. 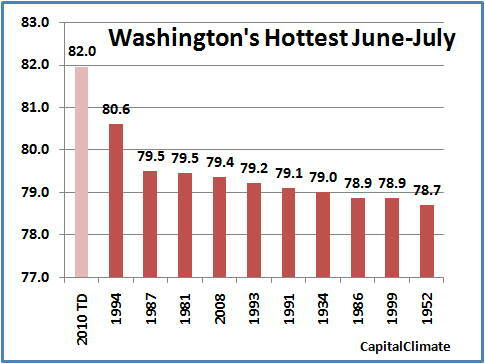 Today's high in Washington of 86°, combined with a higher-than-forecast low of 71°, results in a July average of 83.1°. This unofficially squeaks out a tie by the narrowest of margins with 1993 for the hottest July in 140 years of temperature history. 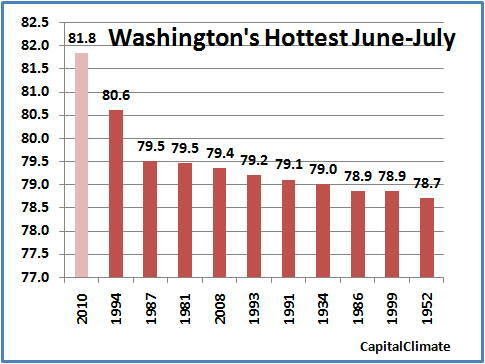 Following a record for the hottest June, this June-July is by far the hottest such period and is the second hottest of any 2 consecutive months in Washington weather history. More details and graphics to follow. Video: Global Warming: Is it True? The author is a former professor of geology who has also held the following posts: Acting President of Oberlin, President of Franklin and Marshall College, President of Reed College, President of the Franklin Institute Science Museum in Philadelphia, and President and Director of the Los Angeles County Museum of Natural History. 9 PM Update: There was apparently a high of 93° after 5:00, as has happened several times recently. 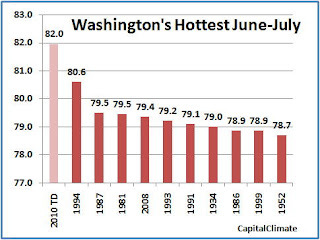 After 2 consecutive days below 90°, Washington's preliminary high temperature today was 92°. Combined with a morning low of 75°, the day was 5° above the long-term average, and the month-to-date July average is now a wannabe record of 83.3°. Another +5° or so are likely tomorrow, but a cooling trend going into the weekend could produce a below-average day on Saturday for the first time since July 3. Depending on how cool it can actually get Saturday morning, the monthly average will be in tight contention with 1999 for second place on the July temperature hit parade. The current forecast is for 63°, which would equal the low for this month. The last time the temperature was below 72° was July 4. Regardless of the final standings for July, the combination with the record warm June is almost a mortal lock to be the hottest June-July by far. The 2-month average to date is a hefty 1.4° above the current record in 1994 and behind only July-August 1980 as the second hottest of any 2 consecutive months in Washington. All of the top 9 previous hottest pairs of consecutive months have been July-August, rather than June-July.